Nancy Duarte has just published her second book; Resonate. She is the CEO of Duarte Design, a design firm which specializes in presentations. Here is a short review of her book. 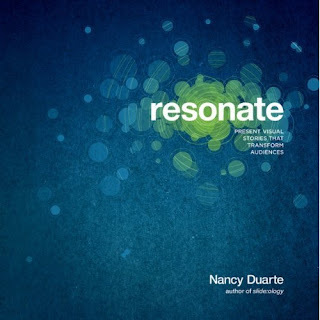 Resonate is a book which tells us how to convert our message into a story and persuade our audiences. We are aware that stories are memorable and understandable. But how do we convert a sales pitch into a story? This book is Nancy's attempt in that direction. Premise: The objective of every presentation is to engage and persuade the audience. The ideology behind this book is that we need to become better story tellers in order to persuade our audience. Essence of the book: Here are a few things which Nancy talks about in her book. a. Understand the audience: In order to resonate, we need to adjust to the frequency of the audience instead of expecting them to adjust to ours. The presentation is ours and it is in our interest that it succeeds. b. Create contrast to be interesting: A presentation can arouse and sustain attention only if there are contrasts; what is (current state) and what could be (desired state). The moment the audience perceives this gap they will become attentive and wait for you to show them how to attain 'what could be'. Contrast can be created in three ways; through content, style of delivery and emotions. c. Emotional connect: Great presentations connect with the audience emotionally. Facts and figures only appeal to the mind. A great presentation needs to appeal to the mind and the heart both. To appeal emotionally we need to tell stories. This is what the book is actually about. Nancy has taken cues from movies and myths and come up with a model which can help us transform our message into a story. b. Hero has a desire. He wants to get something. c. He gets a call to adventure. He is required to go on a journey. g. He achieves what he wanted and comes out victorious. Let us understand this framework in context of a presentation. The Hero of the presentation is the presenter (we)... Wrong! This is the biggest twist. The audience is the hero. They have a desire ('what could be' versus 'what is') which we establish at the start of the presentation. This contrast between what they can become (versus what they are today) gets their attention and they now want us to guide them there. Who are we then? We are the mentor. It is our role to help the audience embark on the journey (point e). It is our role to make them agree, make them act, make them buy what we are selling or invest in our company. The presentation ends there. The stages f and g happen after they have agreed to our call to action. We will now understand the crucial elements of our story. 1. Know the hero: If our audience is the hero then we must know how they are like. Not just their demographics but their likes/dislikes. What are their problems and what they want? That is the only way we can guide the hero to embark on the journey. Unless we know their problem, how can we show them we have the solution to their problem. 2. Mentor well: As a good mentor we need to ensure we leave the audience enriched. Everyone should leave the presentation knowing something they did not know before. 3. Define the journey: The objective of the presentation is to motivate the hero to embark on a journey. So we need to be clear about the destination. Where is it that we want them to go? Our content should guide them towards the final destination like we guide someone on a map. 4. The Big Idea, Resistance and Reward: This is the main message of the presentation, Our point of view. We need to convey what is at stake (that's why people will listen to us). The audience will initially resist because accepting our point of view means giving up their current point of view. Hence we need to motivate them. Show them the reward of accepting our point of view. While doing all this the mentor needs to remain humble. The book from here on enters the world of presentations and covers three things in detail. a. How to create meaningful content? b. How to structure a presentation? c. How to design a message which is memorable? The book is full of case studies where Nancy analyses great presentations and tells us what makes them great. And what makes them great? They are all stories told well. Nancy uses the story framework (discussed above in brief) to make us understand why these are great stories (and hence great presentations). Nancy also goes on to share lots of tips and tricks about making presentations in this 248 page exciting & wonderful book. Want to know who how this book differs from her first book slide:ology? Read what Nancy Duarte has to say by clicking here. Want to know further more? Click here to visit the book's website. Want to buy the book? Click here to buy it on Amazon at $19.77. It is also available on flipkart.com for Rs. 1077 (India). Thanks for the great review Vivek! Resonate is an extraordinary book. It was exciting to read. The best part however starts now. When I start applying it in everyday presentations.